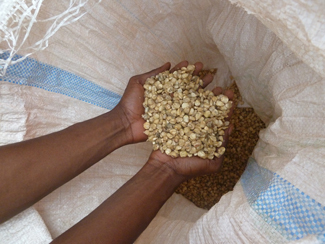 Access to quality seed is one of the most important challenges facing the farmers in the Equateur province, in the Democratic Republic of Congo. 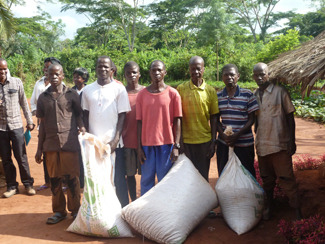 Humana, together with HPP Congo, develops the Farmers' Club project, involving 3,000 farmers. One of the most novel aspects including the initiative is a training on production, multiplication and seed selection. The training on seeds is common to all the Farmers' Club, although in this case is getting special attention in this regard because of its advantages. Availability of quality seeds achieves more pest resistant crops and specific conditions of environmental stress (temporary shortage of water or high temperatures, for example). Produce also more and better crops. Self-management of seeds by farmers themselves saves for them, not having to allocate a portion of their income to purchase. Maize, cassava, groundnut and soya seeds are included in this training, involving 60 farmers. It includes both theoretical and practical training, which discusses issues such as selecting and storing seeds or the importance of intercropping of cereals and leguminous crops so as to protect the soil and add nitrogen. After the training, the 60 participating farmers receive 10 kilograms of maize to multiply as a starting point, applying technical knowledge acquired during the training.